For the stoner who crushes a large pizza and is too lazy to get up off the couch to find their favorite pipe afterward — now there's an app for that. Push for Pizza is a mobile app built on the, "push button, get a pizza," philosophy developed by its creators. While push button pizza is enough to capture the attention of any normal person, the developers at Push for Pizza — who apparently have major consideration for stoners — designed a pizza box that can be made into a reusable pipe. In collaboration with Nikolas Gregory Design Studio, the Push for Pizza "pipe box" has yet to be mass produced. The developers, however, seem to share high exceptions for approval. 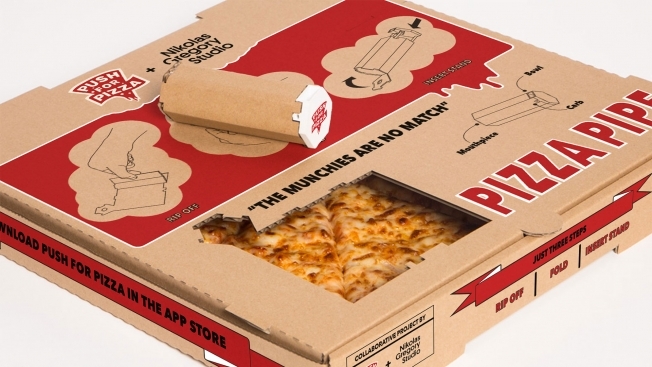 Based on a simplistic design, the pipe can be made by removing a foldable portion of the pizza box's lid, which is perforated. The bowl is made from the "pizza saver" and is made from "temperature resistant white ceramic." The pipe's creators have yet to announce whether or not this pipe-laced pizza box will be available on or before April 20, 2016, if Push For Pizza does debut this stoner-centric invention, we're sure there will be plenty of satisfied customers.